Everybody loves making beats. From plunking out a simple tune on the family piano, to annoyingly hand drumming an out-of-sync rhythm on their legs, humans are inherently musical. The digital crossroads of music creation has only continued to make production even more accessible. People can play around with beat makers on their computers or even in video games like LittleBigPlanet and the upcoming Dreams. Why not gamify the music creation experience? Track Lab is effectively a music sequencer and production timeline in virtual reality with more playful elements than one might find in Audacity or Pro Tools. One side of the game gives players puzzles with missing pieces that must be configured properly to get the track to play, while the other is an untethered creation mode. Looking at the puzzle-filled Evolver mode first—because that’s what Track Lab props up as a sort of tutorial—I am reminded a lot of games like Sound Shapes. Sure, Track Lab isn’t a puzzle-platformer that creates music with skillful death-defying platforming, but in Evolver, music creation is dictated by the player solving the puzzles. Sounds are created by a pulse of light passing through a transparent bubble, much like the cursor on a recording software timeline. Instead of being linear, the timeline is a massive grid floating in front of you. Various elements can change the direction of the light pulse, stop it entirely, or even split it into additional pulses. It’s up to you to figure out how to place these elements to finish the brief loop, layering the loops to make a unique song while the pulses repeatedly play out the samples on the board. Sometimes there are multiple ways to solve a single loop, meaning that the song can come out sounding differently depending on how you both layer the loops and solve each one. The tracks keep evolving, hence the name of the mode. While Evolver lets you solve puzzles to make loops, it doesn’t give you a lot of freedom in music creation. Again, Evolver is billed as a tutorial that gives you an idea of the kind of music and loops that can be produced using Track Lab’s tools, yet somehow ends up the more robust of the two modes, even if the creation side of things is more unbound. Creation does offer a lot of options in terms of samples and ways to play with them. You can choose to start from a completely blank slate or choose from a variety of templates (including the loops found in Evolver). From there, you can have near unlimited freedom to create to your heart’s desire. Mix, match, mash together, and throw effects on the loops. Layer a few of them. Run them on repeat or swap them out for different ones. Track Lab is an apt title for the game, because when all is said and done, these musical experiments stay right there: in the lab. There is no way to finalize, share, export, or otherwise get the track anywhere except sitting around on your own console. Track Lab has the potential to be a pretty cool platform for collaborative music creation too, but there isn’t a hint of an online infrastructure at all. When Sony’s mantra has been “Play. Create. Share.” it’s surprising that such a creative game would be so ultimately isolated. If it had leaned more heavily on Evolver as the main meat of the game, with a fun little creation mode to play around with, the lack of sharing capabilities within the creation mode might be more forgivable. VR can be a great addition to traditionally simple concepts, adding a new layer over the top of them. It can also be a detriment, putting a gate in front of a simple concept that would be better experienced outside of the headset. 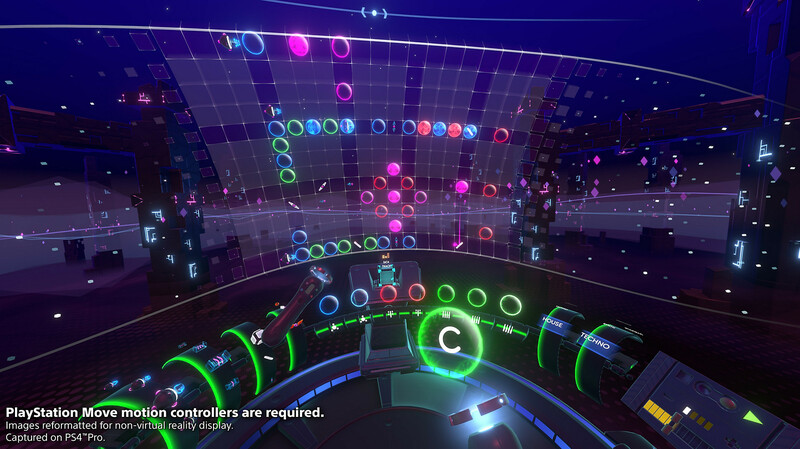 In many ways, Track Lab suffers from its VR integration. VR game developers need to give people good reasons to want to put on the headset, because VR isn’t quite as simple for people to get into as plopping down on the couch and firing up the controller. Track Lab isn’t the experience that will get people to break out the headset to play around with. Even if it were a strictly flat-screen experience, I can’t imagine people wanting to spend much time with Track Lab after toying around with it for a a short time, so it’s a hard sell as a VR experience that doesn’t really add much in the headset. If you want a game, there are better music puzzlers out there with heaps more content, and if you’re looking for someplace to fire up your musical chops, there are actual music production tools that will serve you in better ways than Track Lab’s isolated creation mode. 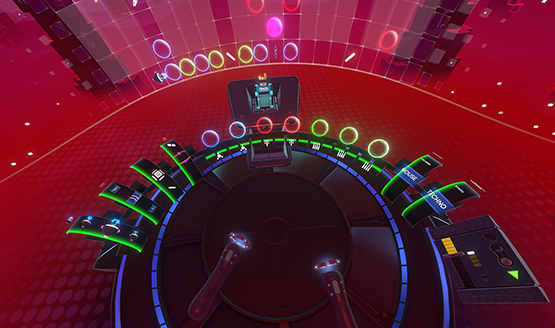 At the end of a long hard day, Track Lab isn’t the game that’s going to get you to pull out your VR headset for even a brief gameplay session. If you desperately want to use a PS4 controller to produce music, wait for Dreams, which will have a far superior audio production toolset and the ability to take your music outside of “the lab.” While a neat concept, Track Lab never polishes any of its strengths enough to shine. Track Lab review code provided by publisher. Version 1.01 reviewed on a standard PS4. For more information on scoring please see our Review Policy here.